• All natural ingredients, no aluminum etc. 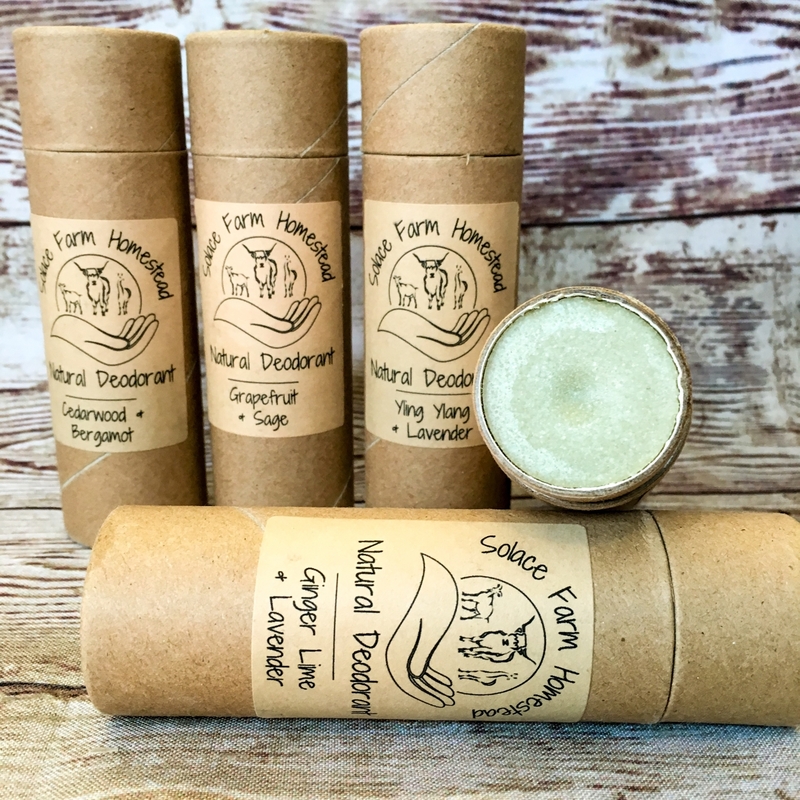 I'm so excited to be able to offer all-natural, plastic-free deodorants! 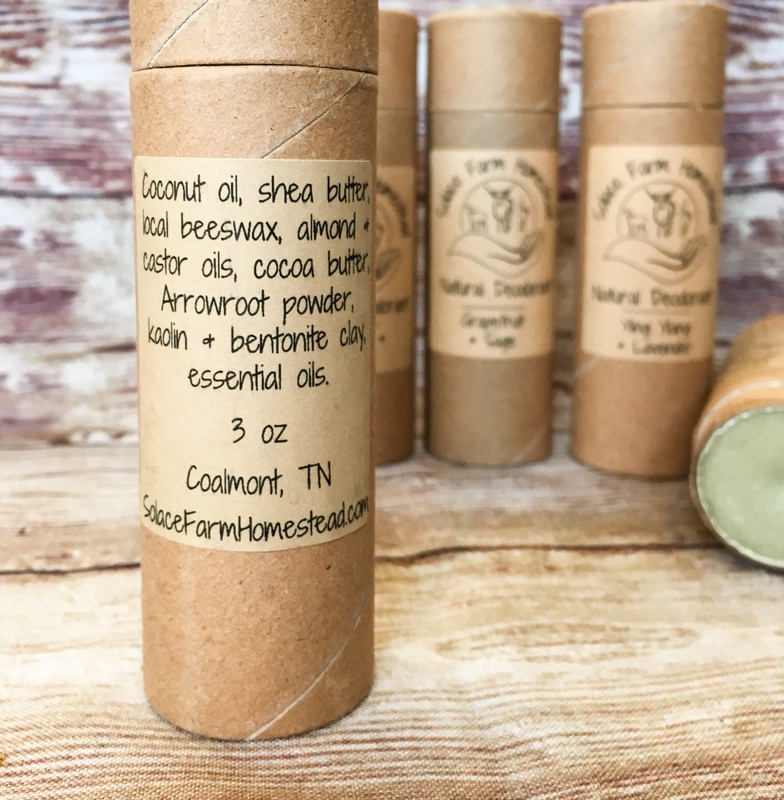 My recipe is based on much research, and then trial-and-error tweaking, resulting in a formula that contains Shea and cocoa butter, local beeswax, coconut and other oils, arrowroot powder and natural clays, and essential oils for both scent and, more importantly, anti-bacterial/anti-microbial power. This recipe is the perfect balance of firmness (beeswax), meltable/glide-on-ness (oils), moisturizing (butters) and function (arrowroot & clay powders, and essential oils) – and there are no harmful ingredients, technically all these components are edible! 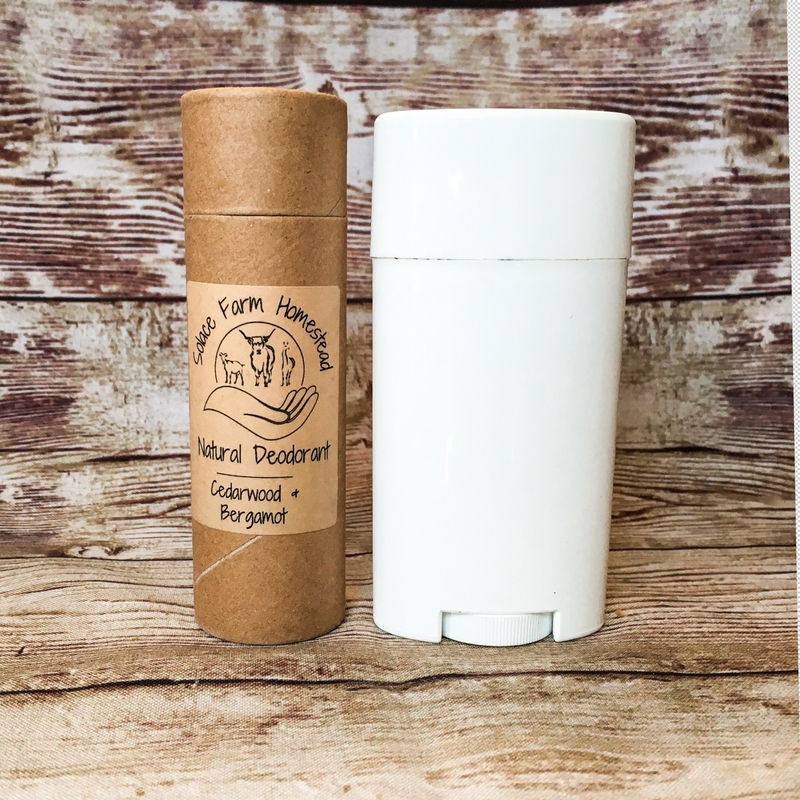 I do not use any baking soda in this deodorant- my research found that many people are allergic to/irritated by the soda in natural deodorants, resulting in rashes. It appears that often users develop a sensitivity to the baking soda with continued use, so I have avoided it in all my deodorants, and use arrowroot starch instead. These awesome paper tubes actually hold slightly more than the standard plastic tubes (3 oz vs. 2.5), yet look smaller with their compact shape. I love that these are completely recyclable/compostable, including the paper label I apply, and the fact that they are so much more attractive is an added bonus. 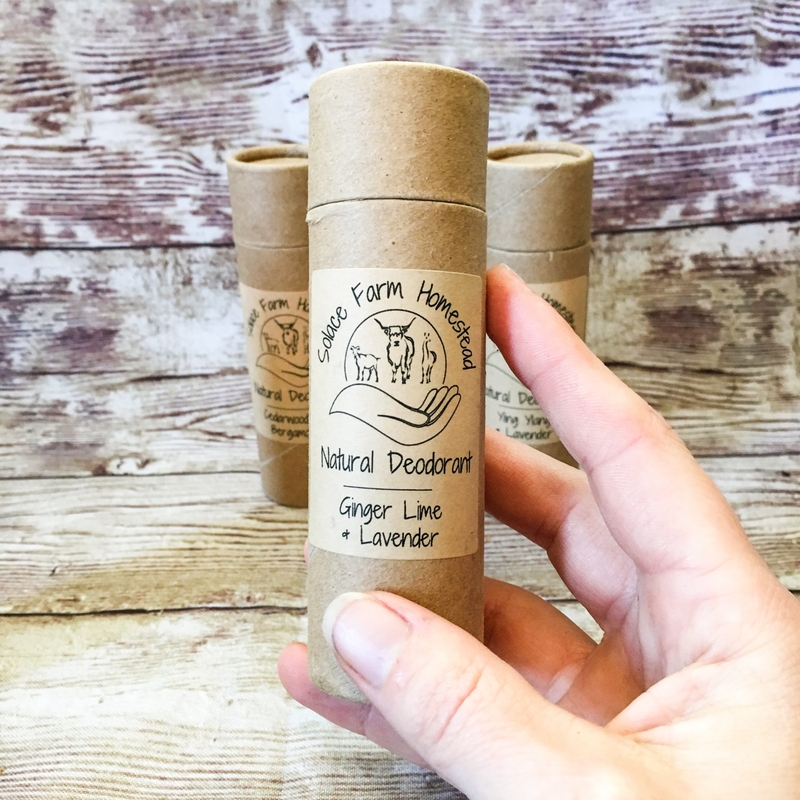 These tubes simply push up from the bottom – it may take a bit of effort to get the contents sliding (hold the tube for a minute, and the warmth of your hand will loosen the contents just enough) but it is such an ingeniously simple design! Because these are paper, and my deodorant is oil-based, there may occasionally be a bit of staining/bleeding on the paper at the mouth, but of course I will not sell anything with more than minimal blemishes. Check for a “seconds” listing if you're happy with slightly-more-than-minimal cosmetic blemishes, at a discounted price, I occasionally have these available. All scents are made with natural essential oils for maximum effectiveness. Citrus oils are sometimes considered potentially problematic for skin use, because they can be photo-sensitizing (irritate skin with exposure to light) in varying degrees. 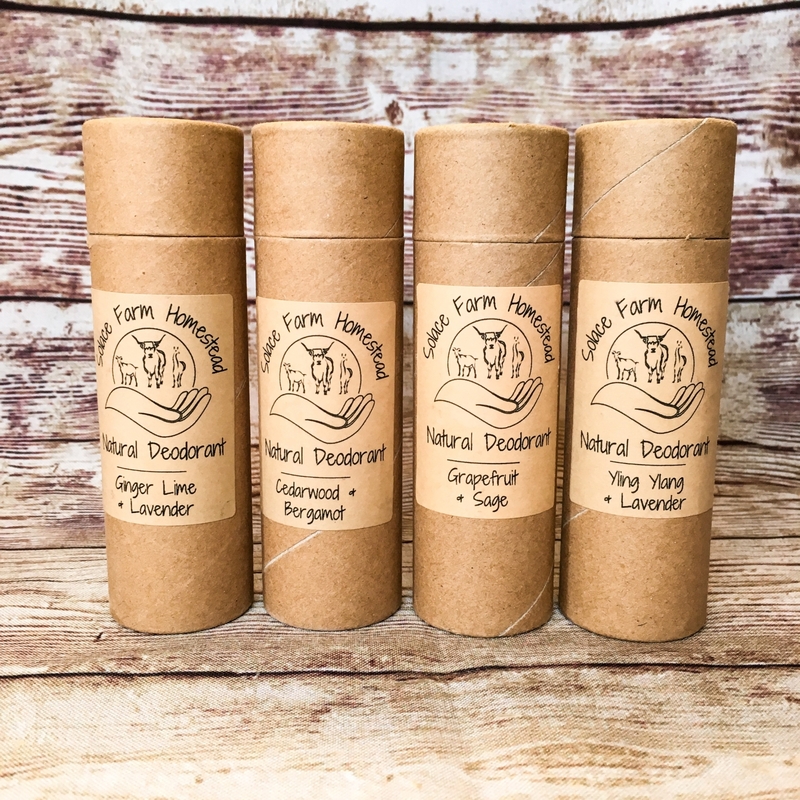 I use them in these deodorants because they are also some of the most effective essential oils for germ-fighting, and for me at least, armpits don't tend to get a lot of sunlight :-) and the oils are used at a low percentage of the total product. Bergamot is the worst of the citrus oils for skin irritation, so I only use Bergaptene-free Bergamot oil in any direct skin applications to avoid any issues (including my tallow balms and tallow lip balms). If you think your skin may get a fair amount of sun exposure and are at all concerned about the citrus oils, either choose a scent without citrus, or contact me for a special formulation without citrus. Spring Rain scent is a house blend of smoky Amyris essential oil with Lavender and Cedarwood EOs, and makes me think “aftershave” - a classic men’s scent for sure.